Phones running Google's Android operating system have become increasingly popular in recent months. (CNN) -- Despite all the hoopla about the new iPhone 4, Google Android phones outsold Apple's iPhones during the first six months of this year, according to market data released on Monday by the Nielsen Company. Smartphones running Google's Android operating system accounted for 27 percent of all smartphone sales during that period, according to the media monitoring group. Meanwhile, Apple's phones made up 23 percent of sales. "While the iPhone has been the headline grabber over the last few years in the smartphone market, Google's Android OS has shown the most significant expansion in market share among current subscribers," Nielsen says in a blog post. Apple's iPhone 4, which went on sale June 24, has been called the company's most successful product launch to date. Meanwhile, a host of new phones have also debuted on the Google Android platform -- but with less fanfare. 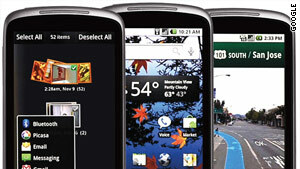 The HTC Evo and the Motorola Droid X are among the most recent competitors. Research in Motion -- the maker of the business-friendly BlackBerry phones -- still leads the smartphone market in the United States. A third of all smartphones sold in the last six months run on RIM's operating system. Despite its recent gains, Android phones are still less popular overall than Apple phones. Of all U.S. smartphone subscribers, 13 percent have Android-based phones and 28 percent have iPhones. iPhone customers are also more loyal to the brand, Nielsen says. Nearly nine in 10 iPhone owners surveyed by Nielsen said they planned to stay with phones on Apple's operating system when they purchased a new phone. Relatively fewer Android owners -- 71 percent -- said they planned to do the same, according to the survey of about 2,100 people. People who own RIM phones were least loyal, with the majority of owners surveyed -- 58 percent -- saying they want to go to another operating system when they buy a new phone, according to the survey. The Nielsen data also show smartphones growing overall in popularity in the United States. A quarter of all U.S. mobile phone owners now have a smartphone, the computer-like phones that also access e-mail and the Web and run apps. One year ago, 16 percent of phone owners in the United States had a smartphone. By the end of 2011, Nielsen says smartphones will overtake the more common feature phones in the United States. Meanwhile, in a separate report, Canalys, a tech analysis firm, says Android phone shipments grew by 886 percent in the second quarter of 2010 over the same period in 2009, making them the fastest-growing category of smartphones in the world. Chris Jones, that firm's principal analyst, in a news release notes the "impressive momentum Android is gaining in markets around the world." Nokia is still the worldwide leader in smartphone sales, that report says. Some tech pundits say the numbers underscore a popular story line in the tech blogosphere: Android is gaining on Apple. Ryan Kim, of the Seattle Post-Intelligencer, writes that the smartphone war really comes down to what smartphone app developers think of the platforms. "The real question is when Android becomes the go-to platform for developers looking to make money," he writes. "Right now, Apple's ecosystem is still more promising and thus, the first option for most developers. But with the sheer number of Android phones out there and an improving Android market, Android is increasingly a threat to win over developers. And when that happens, Apple will really have its hands full." Dan Frommer of the Business Insider has a wake-up call for the iPhone maker. "It's happening, Apple!" he writes.